“The main character, Ciro Lazarri, passed through Ellis Island on his way from Italy. The immigration officer presented him with a list of names and suggested he select one for his American surname. They included Smith, Brown, Jones, Hill and other simple English names, but the inspector suggested changing his surname to Lewis since his Italian surname started with an “L.” Wisely, Ciro refused to change. 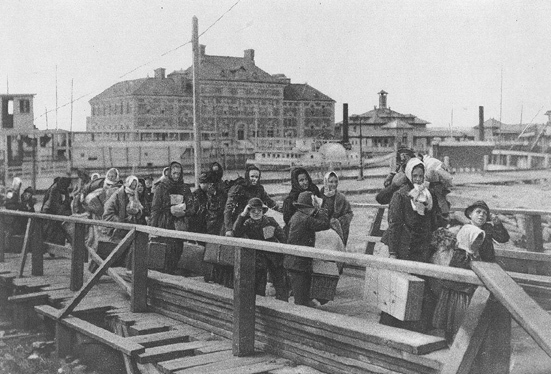 Editor’s Note: I can tell you that in my family, though their name was NOT changed at Ellis Island they did change it within the 1st year of arriving in the US. They emigrated as Kujanpää from Finland in 1900 and with the birth of their youngest daughter in 1901 the surname became Acey! No one can accuse my ancestors of choosing an American name or even a translation of their Finnish name! Did your emigrant ancestors change their name soon after arriving?